The Kelty Sunshade Shelter is one of the best ways to escape the heat while camping. Learn why your family needs this outdoor gear with Kelty Sunshade reviews and consumer ratings. Both the Sunshade large and medium shelters are phenomenal pieces of camping tent equipment that serious car campers should consider investing in. If you are tent camping on California beaches, this can double as a portable tent. Or, if camping in the mountains of North Carolina, this Kelty gear provides sun shelter during the midday heat. No matter where you live, your family can benefit from the Kelty sun shelter. Both the Kelty Sunshade large and medium shelter provide excellent protection from the elements. If you're camping during a storm, escape the rain and put up the Sunshade Accessory Wall for additional protection. Or if it's midday in southern California, you can get into the shade but still feel the ocean's breeze. Either way, the Kelty Sun Shade is a piece of tent camping equipment you always wish you had while in the woods, but forget to buy in the comfort of home. All of these accessories are typical for any sun shelter--however, Sunshade Reviews are unanimously positive. 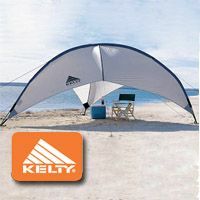 Whether you purchase the large or medium model, you know that this Kelty portable sun shelter will provide excellent protection and comfort for your family. Weight: 10 lbs. 4 oz. Packed Size: 6.5 in. x 30 in. Learn more about the Medium Kelty Sunshade . Weight: 12 lbs. 4 oz. Packed Size: 6.5 in. x 35 in. Learn more about the Large Kelty Sunshade . The Kelty Accessory Wall for the Sunshade is designed to provide additional protection from rain, hail, sleet, sun and other elements. They attach easily, weigh 1 lb, and cost less than $30 from Amazon . While the Accessory Wall is not essential, it does increase the sun shelter's usefulness and is a worthwhile purchase for sun shade owners. Sun protection is a must for serious campers. When it comes to family tent camping, this equipment is a must-buy: Not only can long-term exposure to UV rays be harmful, but an entire camping trip can be ruined by rain. At least with this Kelty sun shelter, you can rest assured that even if it rains, your family will have a place to relax outdoors while being protected from the elements. When compared to other sun shelters, the Sunshade is larger, lighter, and easier to assemble. Quick assembly is a benefit that should never be overlooked when it comes to family tent camping equipment. Customizable height and width further separates the Kelty Sun Shade medium and large shelters from its competitors. While not essential, this bell and whistle can further enhance your family vacation. Finally, Kelty tents have a lifetime warranty, so if the Sunshade ever ripped you can easily replace it thanks to Kelty's excellent customer service. Numerous Sunshade reviews by consumers claim that the tent poles have broken on them during heavy windstorms. If they don't break, the shelter collapses inward and is not stable. This is due to the tent poles being fiberglass, which makes them not as strong as aluminum tent poles. Many campers complain the poles feel like they would easily break under pressure. Since the sun shade's inability to withstand high winds is such a widespread problem, Camping Tent Reviews does not recommend purchasing the Kelty Sunshade if you frequently camp in windy conditions. The Kelty Sunshade provides phenomenal protection from the elements. However, this portable tent structure is what it is. It has its limitations and is not designed for backpacking, extreme camping etc. However, if you accept its limitations and understand its function, then you will not regret purchasing the Kelty Sunshade shelter. REI.com - Excellent customer service and because of the membership benefits. Have you been using Kelty tents? Share your Kelty tent reviews and let us know how it worked for you! 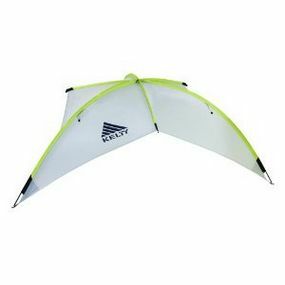 Kelty Tents Reviews and Ratings - Return back to reviews of Kelty Camping Tents. Kelty Mantra 7 - Our review of a fantastic 7 person tent. Kelty Gunnison 2 Tent - If you love Kelty and need a 2 person tent, check out this review. Kelty Ridgeway Tent - If you're considering buying the Ridgeway, DON'T! At least not before reading this review.